In 1910, the Great Central Railway initiated the design of a 4-cylinder Garratt. This was probably based on a pre-existing 0-8-0 design (LNER class Q4), but over time the design evolved to use a 2-8-0 base (LNER class O4 ROD ) instead. This was approved by the LNER in 1924. Initially there were plans for two such engines, although only one was built. Between the initial order in 1924 and construction in 1925, the designed was amended by Gresley to use 3 cylinders at each end, and to use some of the motion from the O2 class. This lone engine (No. 2395) was built by Beyer, Peacock. The frames were laid on 1st June 1925, and was delivered to the LNER on the 21st, ready to be displayed in shop grey at the Stockton & Darlington Centenary celebrations on 1st July 1925. After the celebrations it was painted in black, and entered service in August 1925. No. 2395 was the only Garratt ever to serve with the LNER. It was the first mainline Garratt to enter service in Britain, and it was the most powerful British locomotive of any type. No. 2395's prime duty was to bank coal trains up the Worsborough Incline between Wentworth Junction and West Silkstone Junction. This incline was about 3.5 miles long at about 1 in 40. Typically coal trains of 60+ wagons arrived from Wath pulled by an O4 with either an O4 or an L1 as a banker. No. 2395 would then come off its siding and push from behind the banker. Once at West Silkestone Junction, No. 2395 would then return to Wentworth Junction. The train would continue to the main Sheffield to Manchester main line at Penistone, whilst the other banker would usually remain until Dunford Bridge. Previous to No. 2395's arrival, two O4s were used as extra bankers, to give a total of three bankers! The Silkstone tunnels were notoriously bad for air quality. The Garratt being at the back would suffer the worst. Respirators were tried which took air from near rail-level, however the loco crews objected to sharing equipment, and the trial stopped. The water was very soft, so a protective layer of scale could not build up in No. 2395's tubes. Hence corrosion was a problem, and she was retubed in 1926. In 1927 the firebox was cracked. 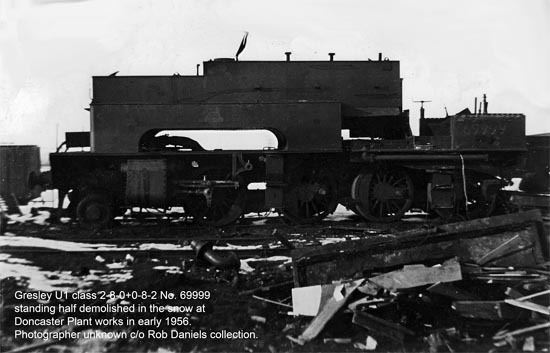 In 1928, further firebox corrosion was found. A chemical solution was tried from 1928, and this appears to have helped the corrosion problems. However, she still spent 9 months of 1930 out of service for reasons unknown. No. 2395 was renumbered 9999 in March 1946, and then became 69999 with Nationalisation. Despite these number changes, she kept the small 2395 cabside numberplates until withdrawal. In 1949, it was realised that a new boiler would be required soon. However, the forthcoming electrification scheme of the Manchester, Sheffield, and Wath lines meant that this would only be economic if alternative work could be found. She was also tried out on the Lickey Incline in 1949-50 and again in 1955. Despite conversion to oil burning in 1952, neither trial was a success. No. 69999 was withdrawn in December 1955 with a final mileage of 425,213 miles. Official accounts describe the final withdrawal being due to the failure of the oil conversion, and widespread unpopularity amongst engine crews. However, anecdotal reports also talk of the London Midland Region's loading gauge restrictions and resulting platform damage. No. 69999 was scrapped at Doncaster. In 1951 I was a fireman at Wath outstation having moved from Barnsley. We were told the Beyer Garratt was coming back, this caused a lot of talk among the drivers as no one wanted to work it. None of the firemen had worked it so we did not know what the fuss was. We were told it had killed a guard on the Lickey Bank so it had a bad name. I fired it a few times it was harder work because of the six cylinders but it was a lot better to ride on than most engines. We would go behind what we called a double train, i.e. sixty wagons of coal, a big engine at the front and same at the back. We would creep up to the back engine, having made contact the driver would open her up and start popping on the whistle so both other engines would know we had made contact, the front engine would pop his whistle and off we would go. The tunnels on this bank at times could be aweful and we would have to breathe through a cloth. Having got to the top of the bank we would let the train go and we would go back down the bank. I think when filling up with water it took 20 mins. When cleaning out firebox etc. we had about 1 hour to 1 1/2 hours. I later worked at Peterborough, New England and I also remember working 8:20 Kings Cross - Peterborough Green Arrow I think which was all black, war time. Note: After October 1927, the surface area of the boiler tubes was reduced, so reducing the total heating surface to 3377.47 sq.ft. Heating Surface: Total: 3581 sq.ft. The sole example of the U1 class was scrapped in 1955. DJH sell a OO gauge (4mm scale) kit of the U1. Gladiator Model Kits sold a 7mm scale (O gauge) brass kit of the U1. Current availability is unknown. British Pathe have a film of the roll out of No. 2395 at Gorton. Thank you to Arthur Bruce for his recollections of firing No. 2395. Thank you Rob Daniels for the photograph of No. 69999 in the process of being scrapped at Doncaster Plant works in early 1956.